Today, Borough Market in London’s Southwark, reopens for the first time since the dreadful London Bridge attacks 11 days ago. The market has been here continuously for over a thousand years, allegedly making it the UKs oldest market. The market had to close immediately following the attack, the traders losing stock and revenue in the process, but is now back and fully open for business. Borough Market is a wonderful part of london, especially for anyone with a passion for food like myself. It is an easy place to spend a few hours getting lost in the maze of restaurants, bars and stalls. Wondering from stall to stall, tasting here, talking to a food producer there, and filling a bag with tasty produce at the same time. The market is renowned for its focus on fresh, quality foods, in many cases being sold direct from the producer. If buzzwords like slowfood, provenance and Farm-to-table mean anything to you then you will love this place. There are a wide range of stalls selling fruit, vegetables, spices, meats, cheeses etc from all over the UK and indeed all over the world. The traders and restauranteers at Borough are more than a bunch of food and drink businesses, they are a very close knit community, like family. Recent events have brought them closer to each other and the local community. Already they have been raising funds for charities such as the Red Cross UK Solidarity Fund. 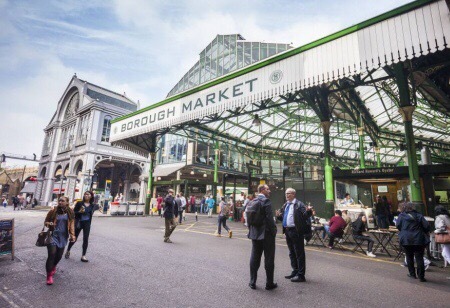 So, I shall be making a point of going along to Borough Market in the next week or so so offer my support, spend some money, enjoy some fantastic food, and show that #LondonIsOpen and that I #LoveBorough – won’t you join me? In December, Borough Market is open seven days a week. For the rest of the year we’re open Monday to Saturday. On Limited Market days, not all of the stalls and shops are open, but there are still plenty of traders here offering a wide range of products. On Full Market days, all of the shops and stalls are open. There are signs marking the way to Borough Market in both the London Underground and mainline stations. Look for these signs before choosing an exit. There are bus stops at London Bridge, Borough High Street and Southwark Street, moments from the Market. If you’re cycling to the Market, we provide secure bike racks in Jubilee Place. 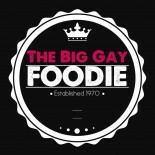 This entry was posted on June 14, 2017 by thebiggayal in Drinks, Eating Out, Editorial, New Openings, Press Release, Restaurants and tagged #LondonIsOpen, #LoveBorough.